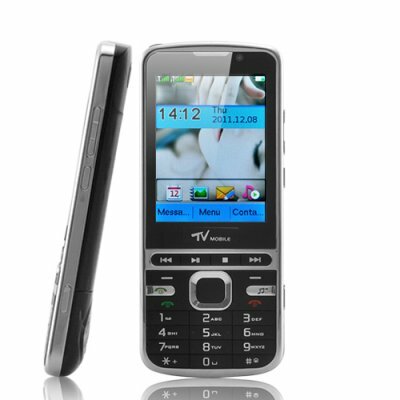 Successfully Added Agilitas - Slim Bar Phone with 2.4 Inch Touchscreen (Dual SIM, Quadband GSM) to your Shopping Cart. Practical and easy to use Slim Bar phone with 2.4 inch touchscreen and all the essential functions you would expect from a phone. Do you need a phone that comes with all the important functions but none of the unnecessary fanciness of a top notch phone? Need a cheap phone to keep connected while sending your Samsung Galaxy Note or iPhone in for repair? Looking for easy to sue phones as Christmas gifts for grandma? Then this is the perfect phone for you! The Agilitas comes with Dual SIM slots for you to use two SIM cards for different purposes. You can have one for business purpose, and one for friends, family, and keep your private number truly private. It’s completely unlocked and fully compatible with all GSM frequencies, meaning that you can use it anywhere in the world. In addition, it comes with multimedia features like video, music playing, analog TV, FM radio, Camera etc to keep you entertained. A phone with multiple features and a humble price, the Agilitas starts paying for itself immediately by bringing you convenience. It’s also a perfect item for resale on your online store. Offered at an unbeatable wholesale price and it’s in stock for immediate shipment worldwide. From you source for high quality low price electronics, Chinavasion. Good Russian localization, good quality. TV is better then on my Star A2000, Star A3000. Screen looks a bit dotted but ok for this price. The only con - it's VERY LOUD!!!! Even when I set volume = 1 it's screaming. Could be solved by usinf non-standard melodies with low volume but anyway.